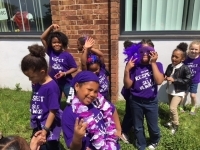 Self-Ulwazi won the house party this school and celebrated in all purple! There was purple pop, frosting, plates, cups, and napkins. Pizza and dancing outside to celebrate the end of the year.